The Original EZ Leaf Hauler is one of those products that you never knew you needed. The Hauler allows you to transport leaves and debris from your yard with ease without the need to buy gas for a blower. It looks like a tarp, but it is so much more! With two included stakes, the Original EZ Leaf Hauler will stay in place on the ground despite windy conditions. It's large 35 square feet size (7 ' x 5') surface holds 5 times more than a wheelbarrow. Three of the sides have a 12" x 24" wall, and the fourth side is open for easy access to rake your leaves in. The built-in handles (6 total) make is very easy to move the Hauler full of leaves or debris with no lifting. 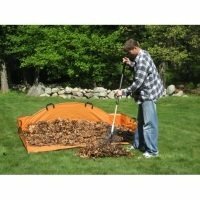 Best of all, the Original EZ Leaf Hauler is maintenance free and folds up for storage. Love the EZ Hauler, but don't need one quite so large? Check out our Sport EZ Leaf Hauler. Built just as strong as the Original EZ Hauler with a surface area of 24 square feet.